Honda have officially launched a Facebook fan page today which i had been working on. 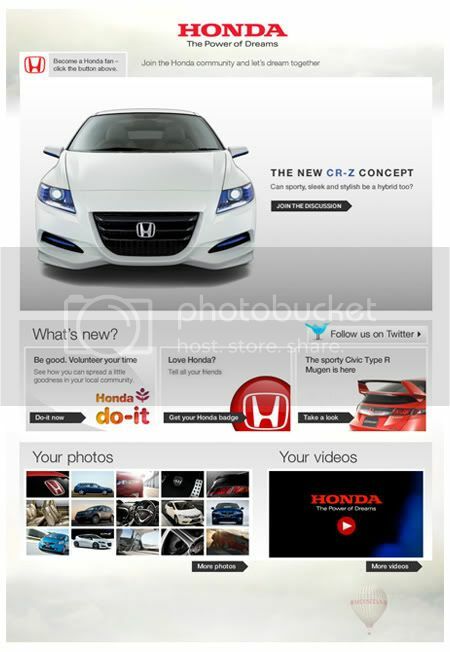 The brief was to create a brand experience portal, inspiring the Honda communities to share photos, videos & memories relating to Honda products. It will also be a space to showcase all of Honda's current campaigns such as the new Type R Mugen launch and the Honda 'Do It' campaign, as well as encouraging people to get follow the latest news regarding Honda via Twitter. This is the start of hopefully a stronger presence in Facebook for Honda, with many bespoke Honda channels coming up. There has also been the launch of a Facebook fan page specifically for the Type R Mugen here.